Total bag (Top-Bottom Length) with fringe 19"
Check out all of the photos! This bag looks larger on the model... but it is medium in size. 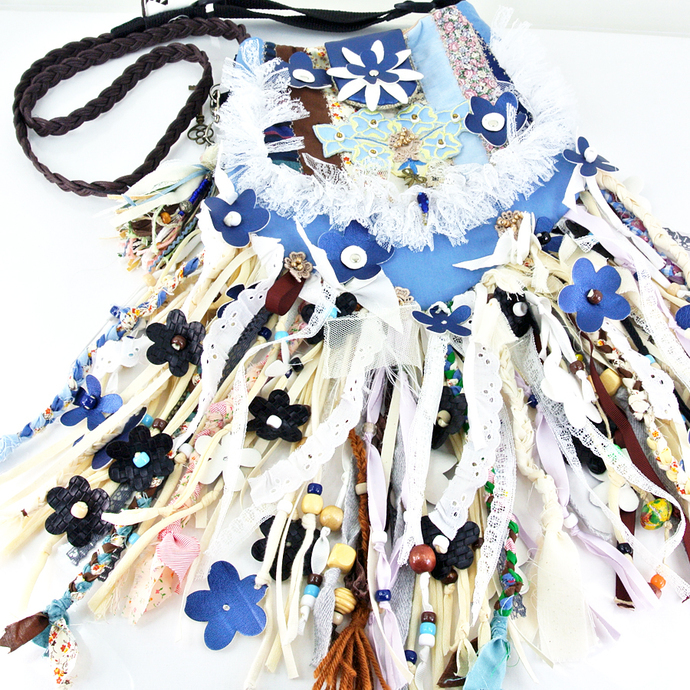 My Gypsy handbags are all handmade from scratch using my own designs & patterns. They are lovingly made from my collection of vintage and new materials. 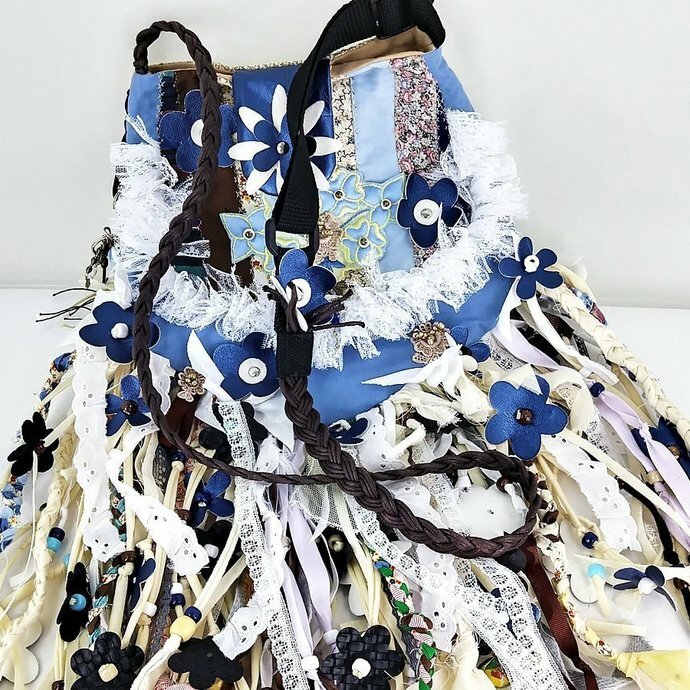 From old lace, leather, woven fabrics, metal findings, rings, feathers, beads, semi-precious stones, pearls, buttons, wood, shells, fringe, up-cycled, old and new. The seams are stitched/reinforced multiple times with quality threads. Millions of hand stitches go into each bags (ok, I haven't really counted the individual stitches). But, I do put a lot of hand sewing into each bag. Quality goods are always lovingly made by hand. The look and feel cannot be duplicated in a factory. They are even sewn on my vintage machines! The bags with no flap are designed to be two sided with complimentary, but, different designs on each side. 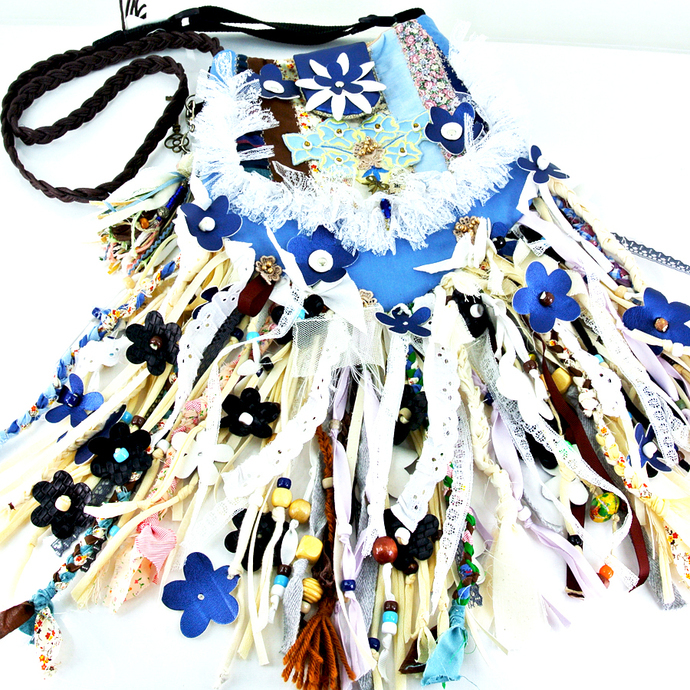 Closures may include large spring-snap, large buttons, beads, wooden/ceramic clasp or a large fold-over flap. 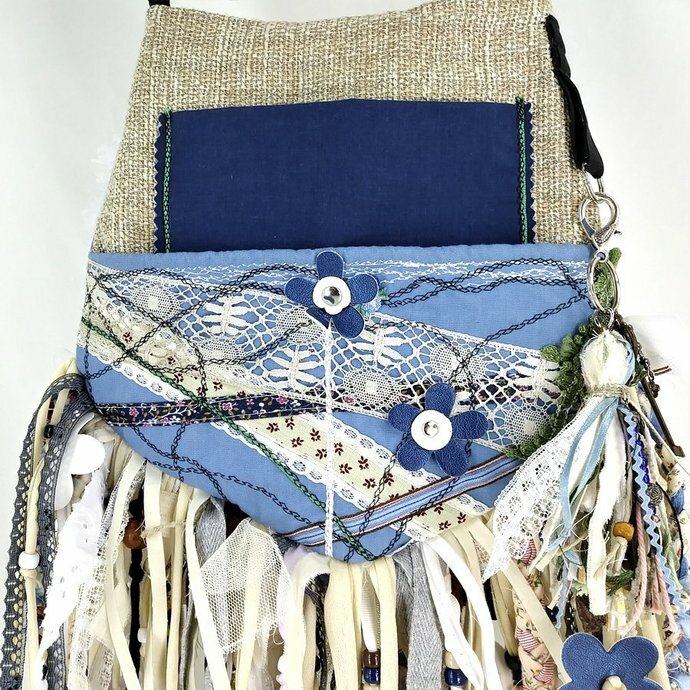 My gypsy bags are all fully lined in fabric(s) with several inside pockets. Some bags have an extra small snap pocket for tiny treasures. The upper edge of the bag is finished with hand stitching to give it a quality feel. By hand stitching the edge, my Gypsy Goods handbags have soft structure to them to keep their shape (instead of looking like a sloppy grocery sack). Large bag: One large reinforced pocket-sectioned into two sides. Medium bag: One reinforced outer pocket. Woven, fabric, macrame... etc. 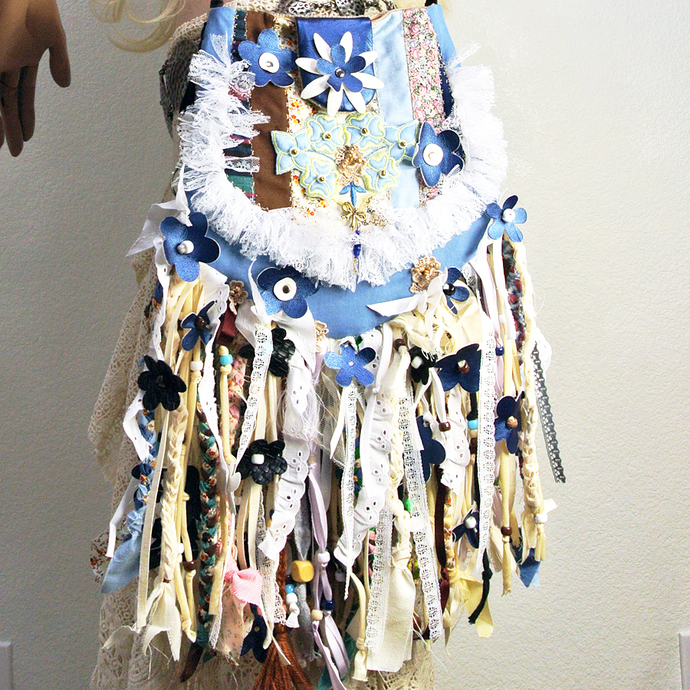 All of the straps are adjustable for cross-body or shoulder style. They are all reinforced inside with multiple rows of tight stitching-no worries about broken straps. Bonus: A big detachable boho gypsy tassel hangs from a ring on the side of each medium & large purse. 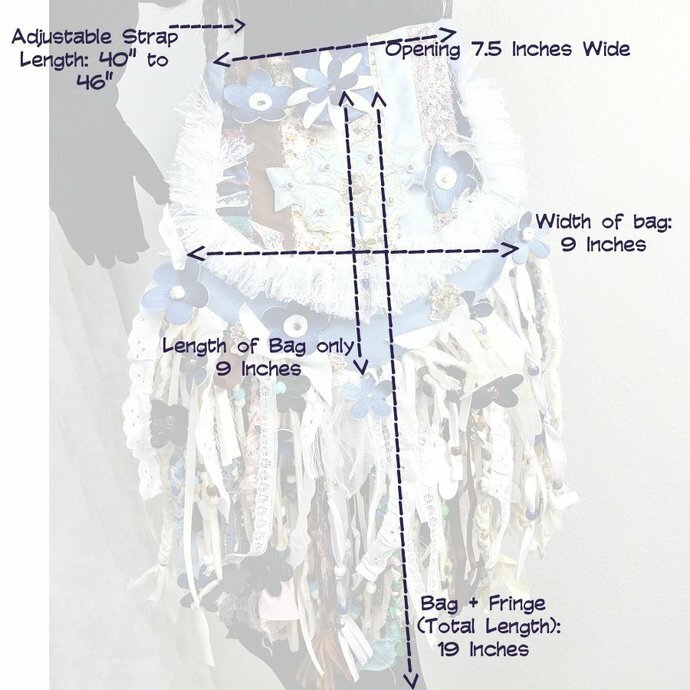 The listing has several types of photos that include the sizing for the bag, close-up photos of the detail and a photo on my mannequin for scale. 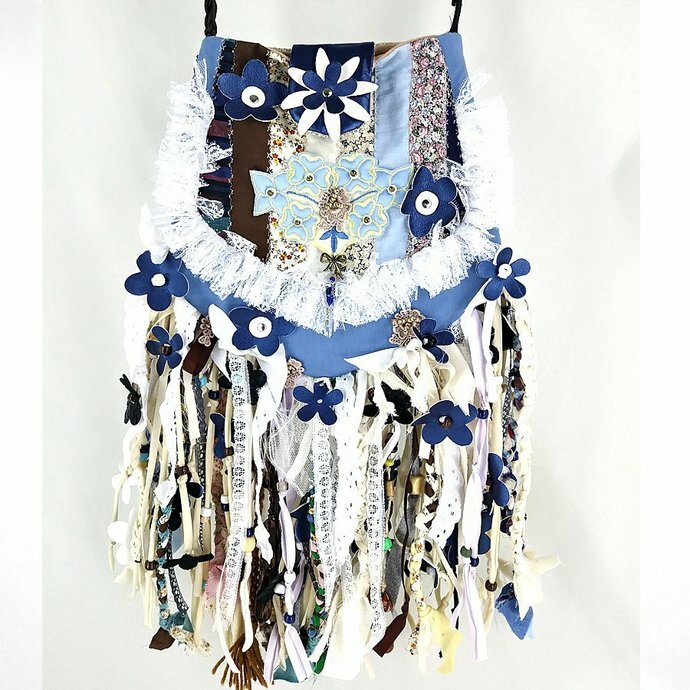 My gypsy bags are designed as wearable art and one of a kind. The quality of my bags will make you fall in love with them. Details are everything... A little vintage charm, embroidered design or pretty beads in the tassel. If this one isn't calling your name... wait and maybe the next bag will be the one for you! Do you have any questions that I didn't cover here? Please, feel free to contact me!